Latitude: 49.234347. Longitude: 2.035263. On the headland at the north side of Jersey, in St Martin’s parish, stands the ancient monument Dolmen du Couperon, a late Neolithic gallery-grave that was partially restored in the early part of last century. Also known as Le Couperon and Le Couperon Dolmen. The monument stands 50 metres across the field to the west of Rue de Scez and the 17th century brick-building known as the guardhouse. Just to the north of the monument is the beautiful Jersey coastline of Rozel Bay, and a few miles further west the little village of Rozel. Dolmen du Couperon stands at the side of a field overlooking the seashore of the north Jersey coastline, a haven for holiday-makers; the nearest town being St Helier several miles to the south-west. Although the monument has been partly restored a couple of times it is still in a reasonably good state of preservation. The gallery of this ancient tomb is roughly 8 metres long, while the whole monument across is 4 metres wide. It is formed from two parallel rows of upright stones and, above them large slabs laid rather ‘haphazardly’ across make up the roof. And 18 smaller upright stones or peristaliths surround the grave (at each side) and indicate the width of the original low, covering mound, which was made of stones, although the kerb may originally have continued in a straight line, instead of curving round like it does today. When it was being partially restored back in 1868 and 1919 some of the outer kerb-stones seem not to have been put back into their former positions, in particular the stone at the east side is not in situ – the thinking being that it should perhaps have been halfway along the gallery, acting as a sort of ‘dividing stone’? And the portal stone has been positioned so as to block the gallery’s entrance at the east-side, but again this ‘may’ not be in its original position. The tomb is thought to date from the late Neolithic period (3,250-2,850 BC). No significant artefacts were excavated from the gallery-grave, apart that is from fragments of flint and pottery. Could the tomb have earlier been robbed by treasure-seekers? ; and of the few finds here no knowledge exists as to where these were taken to! But all in all this is a very nice ancient monument. Dillon, Paddy., Channel Island Walks, Cicerone Press Ltd., Milnthorpe, Cumbria, 1999. 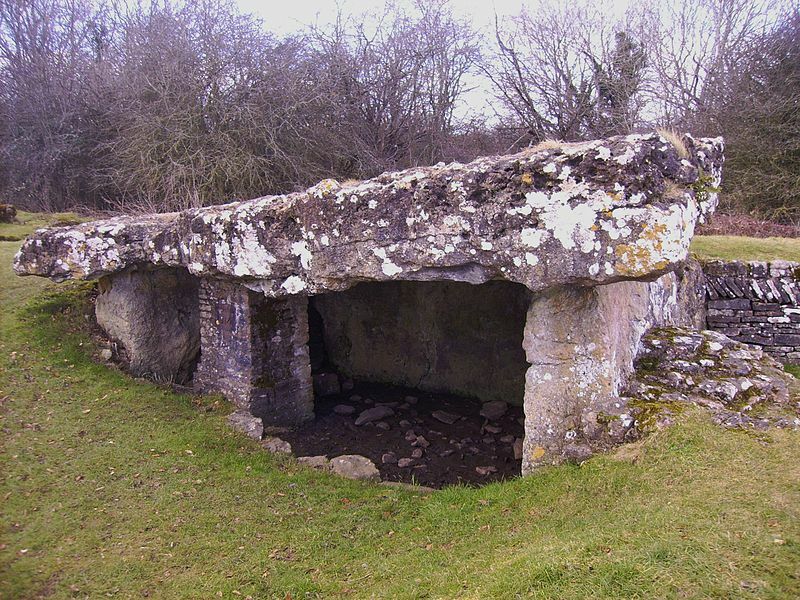 Categories: Burial Chambers / Cromlech / Dolmens, Burial Mound | Tags: Dolmen du Couperon at Rozel in Jersey | Permalink. Druid’s Altar at Clooncoe, Co. Leitrim, Ireland (Photo credit: Wikipedia). Irish grid reference approx N1046 9305. In the wooded grounds of Lough Rynn Castle, a 19th century building that is now a luxury hotel in 10,000 acres of land, stands a prehistoric monument. 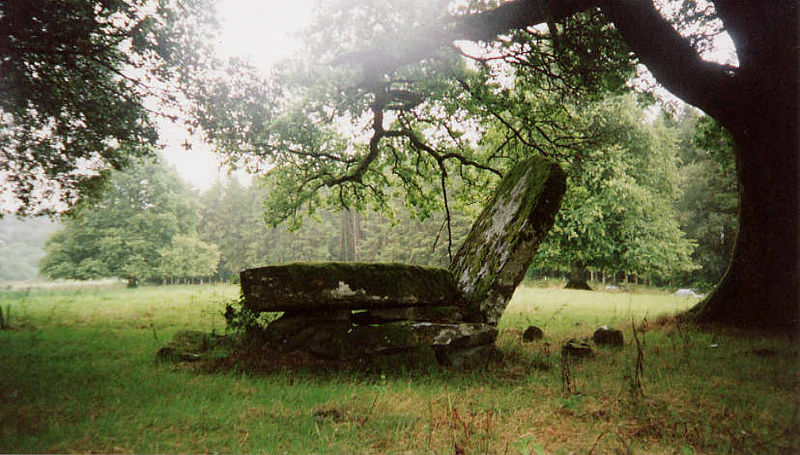 At the place called Druid’s Hill in the far south of the castle grounds between Lough Errew and Lough Rynn, south County Leitrim, there is a curious prehistoric antiquity shaped like a chair or a table, locally called the Druid’s Altar (Cloch an Draoi) or Clooncoe Cist. Unfortunately, this megalithic monument, sometimes referred to as a cist-grave, cromlech or dolmen, has been hidden away and perhaps rather forgotten due to it’s location on private land. It is situated beside a pathway beneath trees not far from the south-western shore of the small round-shaped Lough Errew (Erril) and close to the eastern shoreline of the much larger Lough Rynn and, the elongated Lough Clooncoe is just to the south, while the village of Mohill is two and a half miles to the north on the R202 road. 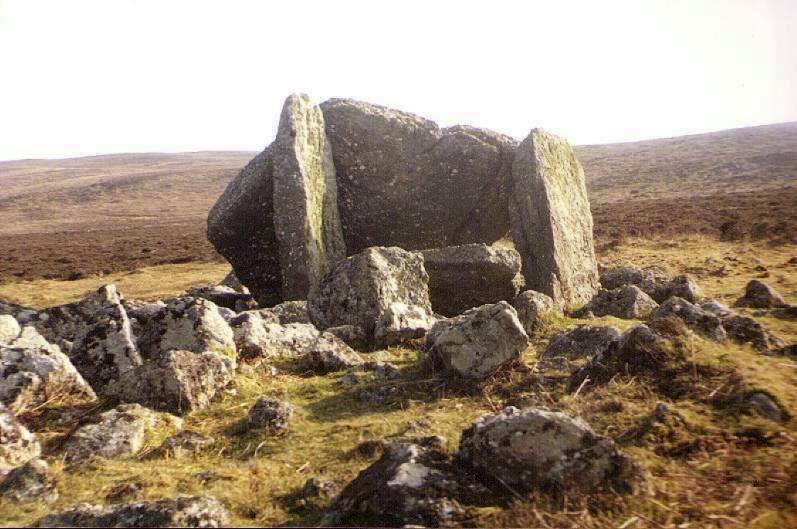 This solitary megalithic tomb known as The Druid’s Altar or Clooncoe Cist is an odd-shaped antiquity, dating from the Bronze-Age, roughly 2,000 to 3,000 BC; and certainly it does resemble a ‘table and chair’. The very large ‘recumbant’ capstone, if that is what it is, is 1.8 metres (5 feet 9 inches) in width and may originally have stood upright, although we don’t know this for certain. Beneath this horizontal slab there are some smaller, low stones which support the structure and, beneath these there is a small stone chamber (cist) also spelt as ‘kist’, which would have perhaps held the remains of a tribal chieftain from prehistory. At the east side another massive slab stands almost up-right though it leans slightly outwards. This stone measures 2.2 metres (7 foot 2 inches) high, 1.3 metres (3 feet 8 inches) across and about 0.30 metres (nearly 1 foot) in depth; the top of the stone is curved or rounded and could well be a “grave marker”, according to author Paul Swift in his work The Lakes of Ireland, now being published in the famous Ireland’s Own magazine. Or could the standing stone be the doorway to the tomb? There is no real evidence to say that the druids ever used this megalithic structure as an altar for their religious rituals – that is merely myth and legend that has no substance in reality. Or does it? 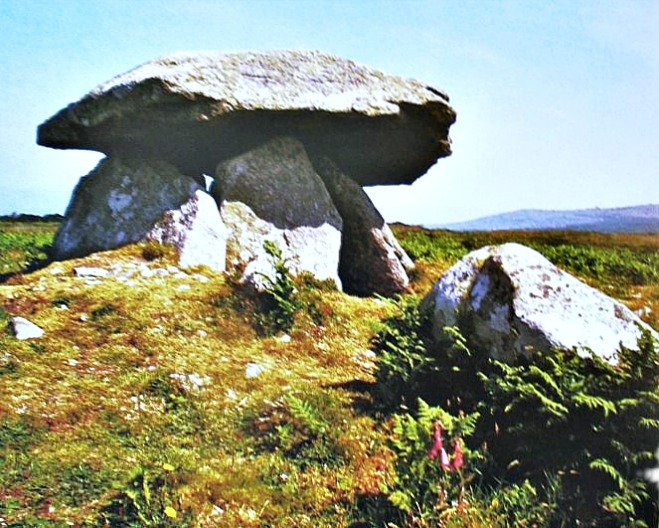 The Celtic term for this monument is “cromlech” meaning “crooked stone” usually a single chambered megalithic structure, whereas Dolmen (Dolmain) is the term for a portal tomb, grave or quoit – also a single chambered tomb; this name tends to be more prevelent in France, Spain and in other countries, even as far away as India. 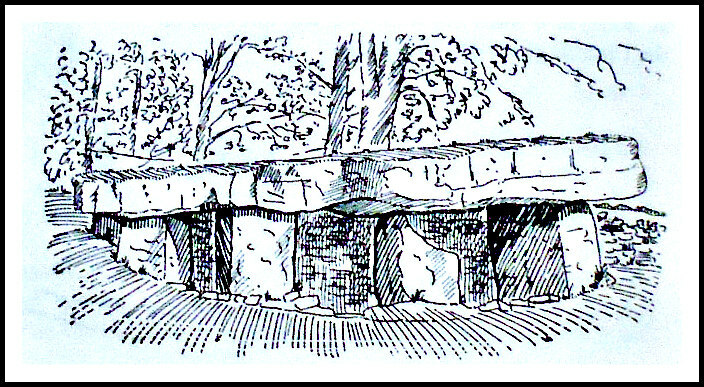 The term “dolmen” could be the same as “tolmen”, a hole stone or holed-entrance stone. Swift, Paul., The Lakes of Ireland, Ireland’s Own no. 5,421 November 29th, 2013, Ireland’s Own, Rowe Street, Wexford, Ireland. Categories: Burial Chambers / Cromlech / Dolmens | Tags: Clooncoe Cist in County Leitrim, Druids Altar at Clooncoe in Co. Leitrim | Permalink. Os grid reference 4021 3395. 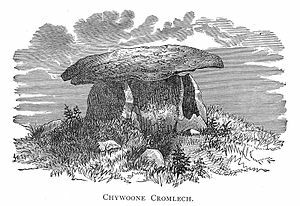 On the windswept moorland of south Cornwall at the northern edge of Woon Gumpus Common stands the famous and well-preserved mushroom-shaped Neolithic burial chamber or portal dolmen, Chun Quoit, which is also sometimes called a cromlech (cromlech being a Welsh term). It’s not an easy monument to get to but it is probably best reached from footpaths coming off the B3318 (north road) to the west and walking in a north-easterly direction. 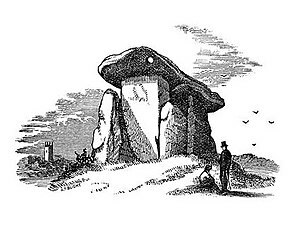 The author John Hillaby in his book ‘Journey through Britain’ sums up the approach to the ancient burial chamber like this: “It loomed up over the horizon like a huge stone mushroom”. 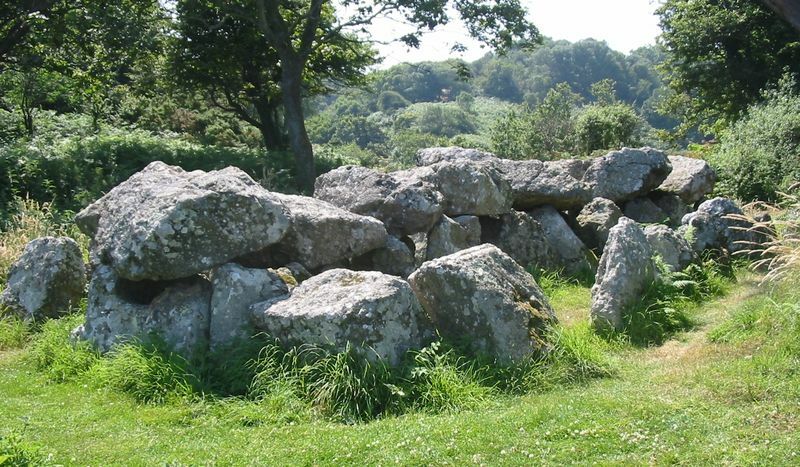 A quoit is the Cornish term for a burial chamber, of which there are several in this part of the country. 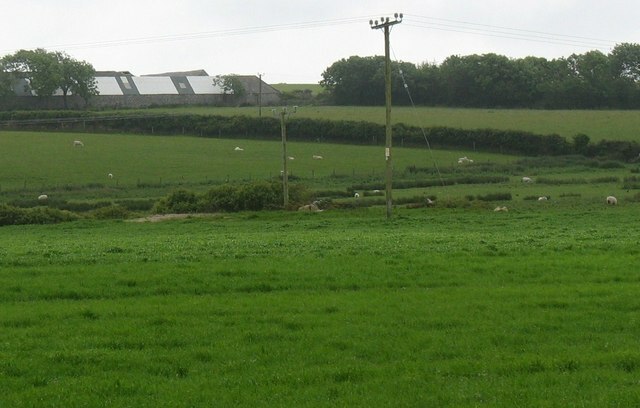 The little village of Morvah lies about 1 mile to the north on the B3306 road, while the Cornish town of Penzance is 4 miles east on the Lanyon-Madron road. Chun Quoit sits within a low, round-shaped mound 35 feet in diameter, all that now remains of the original soil mound (round barrow) that covered the burial chamber before erosion took over. A number of small outer boulders stand in this kerbed mound that was probably the forecourt. 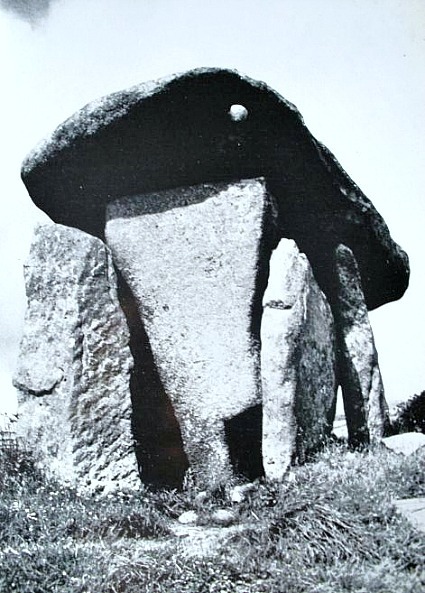 The quoit stands proudly over 7 feet in height with a huge boat-shaped granite capstone that sits quite comfortably on it’s 3 upright granite stones all roughly 5 feet high; but at one end it overhangs – looking precariously like it could slide off at any time – this is because a fourth upright stone has itself slipped to one side and does not “now” support the monument. The rounded (convex) capstone measures 10 feet by 9 feet and is over 2 foot thick; and is said to have a single cup-mark. Almost certainly it weighs several tonnes. It’s inner chamber is closed or blocked off by the 3 large upright stones thus stopping any would-be intruder from entering the grave and so allowing the body and soul of the dead chieftain to ‘rest in peace’. It obviously worked too because anyone would have great difficulty squeezing through to the chamber’s inner sanctum. Chun Quoit is thought to date back between 4,000-6,000 years to the Neolithic Age. The name ‘Chun’ means ‘House on the Downs’. Some 300 yards (100 metres) to the east of Chun Quoit are the round-shaped earthworks of an Iron-Age hillfort, Chun Castle, which is more recent in date, roughly 2,000 years or so. But all around this area there are other prehistoric sites:- Lanyon Quoit, the sacred Men-an-Tol holed fertility stone with its adjacent phallic stone, and the Men Screfys standing stone, being just three other local antiquities within a couple of miles. This particular part of Cornwall appears to have been a Neolithic trading route to and from the coast of Brittany and probably northern Spain as well. Hillaby, John., Journey through Britain, Paladin Books (Granada Publishing Ltd)., London, 1983. Jones, Sally., Legends of Cornwall, Bossiney Books, St Teath, Bodmin, Cornwall, 1980. Categories: Burial Chambers / Cromlech / Dolmens | Tags: Chun Quoit at Morvah in Cornwall, Chun Quoit burial chamber in Cornwall | Permalink.